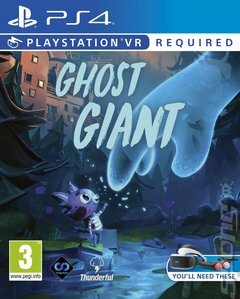 Ghost Giant is a PSVR game that kinda-sorta makes you someone s big brother, having you help out the game s protagonist through a series of challenges. In case the title didn t make it clear, you re a giant ghost. Louis, on the other hand, is painfully real within the context of the adventure you re about to have. Tasked with looking after his family s farm, he s having a really tough time of it. So tough, in fact, that this is a game that really will tug on your heartstrings (no giant ghost hands are required for that). It s this narrative that s the real heart of the game, and helping him navigate is your role here. The world itself is an incredibly rich pastel place populated by cartoonish animals. Despite this, there s a crafty physicality to the world that will make you want to root around in it and explore every last nook and cranny. This tactility really works for the game, as the primary way in which you interact with the world is by using the Move controllers as your hands, shifting things around to solve puzzles as they arise, or perhaps dipping a paintbrush into the environment to get colours for a painting. Don t let the simplicity of the art style fool you this is a tender and heartfelt game with a surprisingly powerful emotional core.